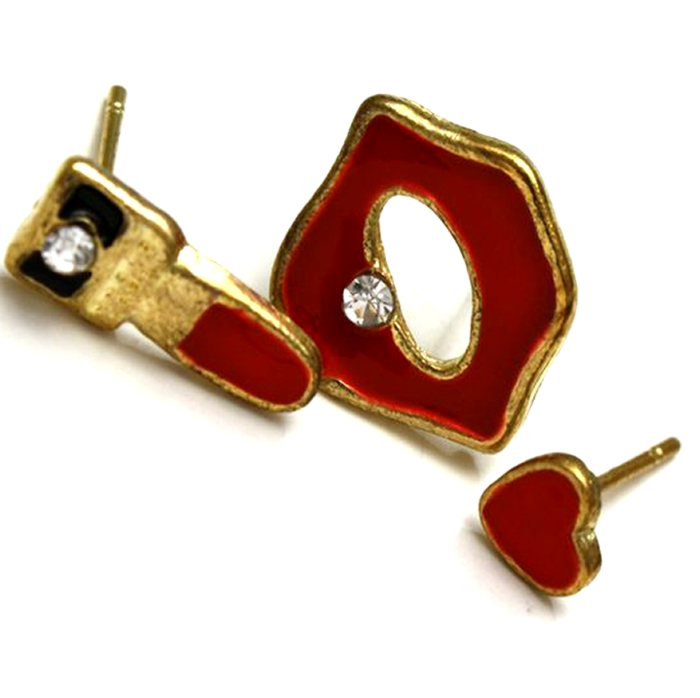 Set of three 1950s feel stud earrings: red lips, a red lipstick and a red heart. All studs are set in a gold metal and are decorated with red and black enamel, the lips and lipstick are finished with a silver jewel. Lips measure 2cm across and 1.3cm in height. Lipstick measures 1.5cm in height and 0.5cm across. Heart measures 0.5cm across and 0.5cm in height. This set conjures images of the 1950s, Marilyn Monroe and her famous red pout, and even the Rockabilly fashion movement. Would be perfect paired with a classic 50s style dress or with jeans and a headscarf for that vintage look.